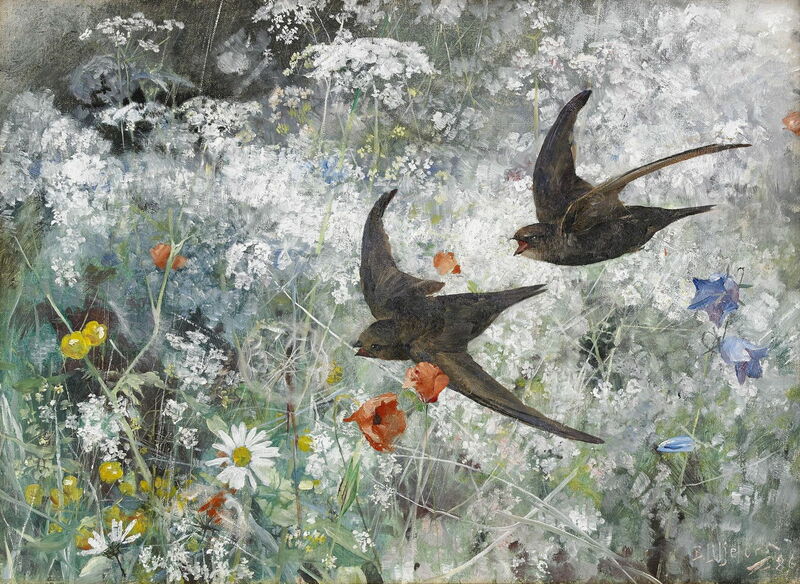 Bruno Liljefors (1860–1939), Common Swifts (1886), oil on canvas, 41 × 56 cm, location not known. Wikimedia Commons. The more prescient painters of the nineteenth century could see where the upstart technology of photography was heading. Even before 1850, photographers were setting up portrait studios and stealing their business. Until well into the twentieth century, and even to a degree still today, there were genres in which painting remained unsurpassed. One had started back in 1502, with Albrecht Dürer’s watercolour of a Young Hare: wildlife. It was a genre which didn’t really exist until the nineteenth century, despite Dürer’s superb pioneering works, because few really took much interest in the birds and animals which lived in the countryside, until the biological sciences developed and flourished in that century. The nineteenth century saw the development of a new, objective style of painting in botanical and ornithological work in particular. Artists like Edward Lear illustrated multi-volume scientific publications classifying and describing different species. One of the pioneers who painted rather than illustrated wildlife was the Swedish artist Bruno Liljefors (1860–1939), revered today as one of the genre’s most influential figures. In this article and the next, I show some examples of his paintings which, a century later, are still some of the finest artistic depictions of wildlife in the history of art. Liljefors was born in Uppsala, in the east of Sweden, in the same year that Anders Zorn was born. He doesn’t appear to have been quite as precocious a painter as the young Zorn, and started his studies at the Royal Swedish Academy of Arts in Stockholm four years later than Zorn, in 1879. He left the Academy after three years, and went on to Dusseldorf to learn to paint animals. Bruno Liljefors (1860–1939), Sledging (1882), oil on canvas, dimensions not known, Nationalmuseum, Stockholm, Sweden. Image by Szilas, via Wikimedia Commons. 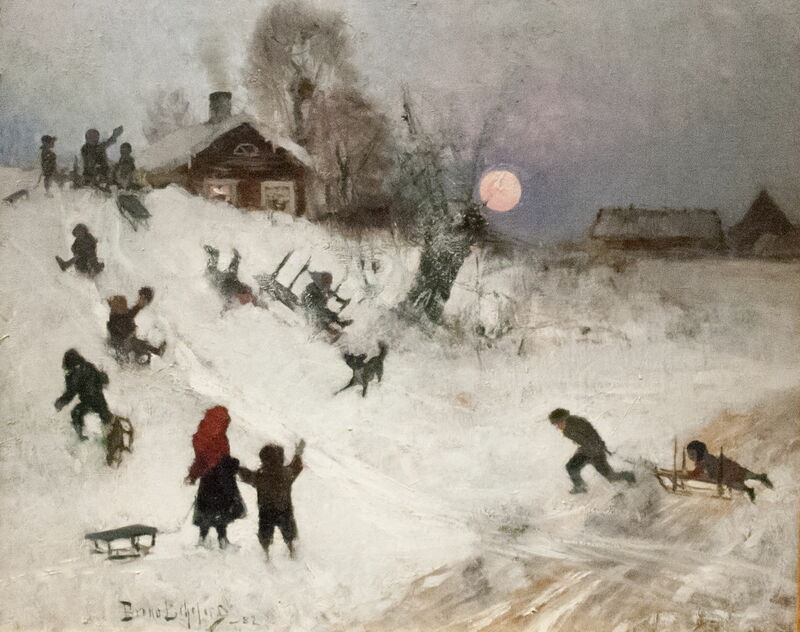 Sledging (1882) is one of Liljefors’ early works, from these student years. During this period, he travelled to Rome, Naples, and Paris, and was particularly inspired by the artists’ colony at Grez-sur-Loing, then dominated by the ideas and style of Jules Bastien-Lepage. Liljefors perfected his plein air painting technique, and was influenced by the Japanese woodcuts which were so popular at the time. Liljefors aligned himself with the ‘Opponents’, a large group of Swedish artists who effectively seceded against the conservatism of the Academy. Bruno Liljefors (1860–1939), Hawk and Black Grouse (1884), oil on canvas, 143 x 203 cm, Nationalmuseum, Stockholm, Sweden. Wikimedia Commons. During the early 1880s, Liljefors started to paint highly Naturalistic works showing wildlife set in realistic surroundings. 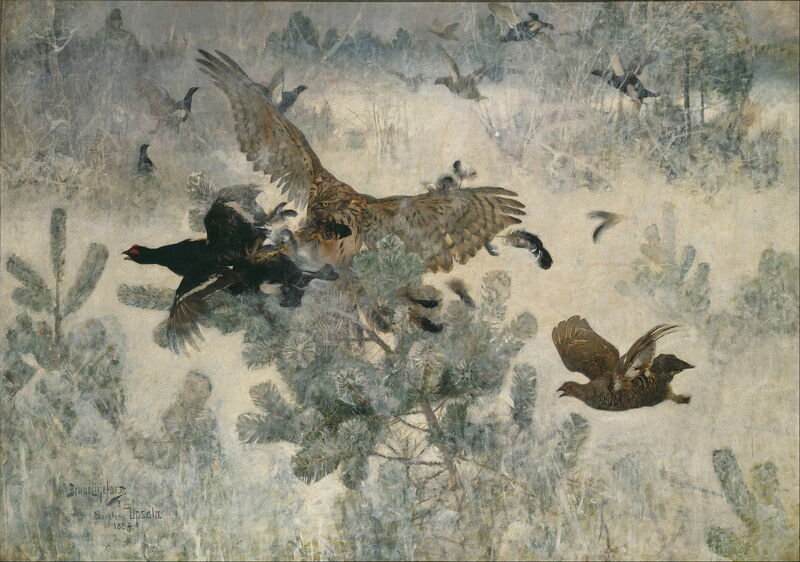 Hawk and Black Grouse (1884) is a good example of these, showing a hawk attacking the gamebirds in a winter landscape. 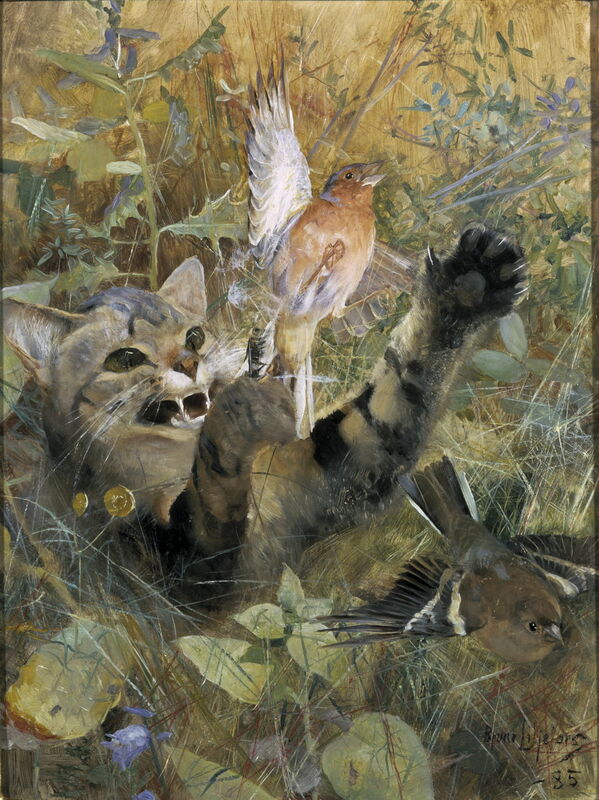 Although he had a deep affinity with his subjects, Liljefors was also a hunter, and many of his paintings explore the predator-prey relationship, as here. His hunting also provided him with dead specimens which he used as subjects. 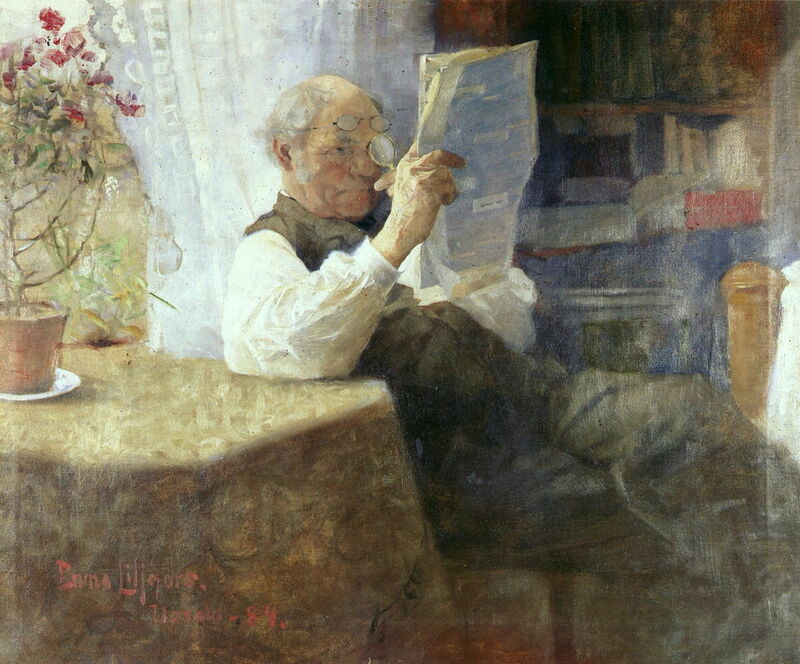 Bruno Liljefors (1860–1939), Portrait of the artist’s father (1884), oil on canvas, 55 × 66 cm, Private collection. Wikimedia Commons. This intimate Portrait of the artist’s father from 1884 shows his skill as a portraitist, something which he seems to have exercised seldom, but which demonstrated that he could paint humans just as well as wildlife. Bruno Liljefors (1860–1939), Anna (1885), oil on canvas, 95.5 × 79.5 cm, location not known. Wikimedia Commons. This portrait of Anna Olofsson was painted in 1885, when they were courting; they married in 1887, but broke up in the early 1890s, and in 1895 he married her younger sister Signe. 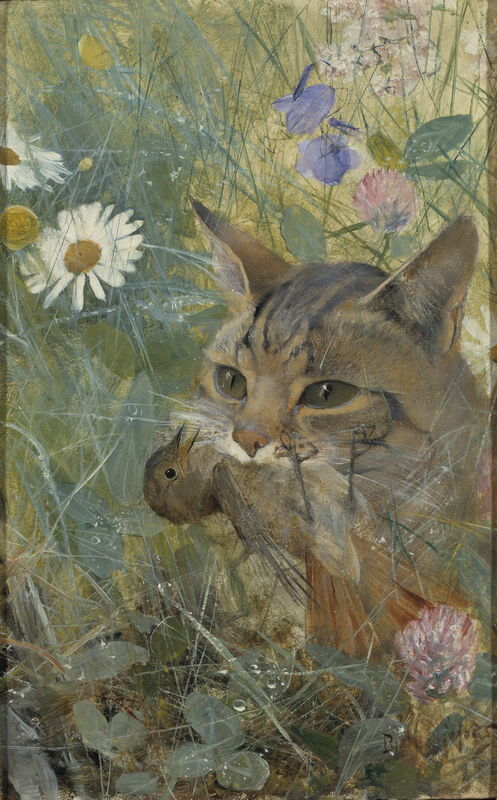 Bruno Liljefors (1860–1939), A Cat with a Young Bird in its Mouth (1885), oil on wood, 26.5 x 16.5 cm, Nationalmuseum, Stockholm, Sweden. Wikimedia Commons. In 1885, he demonstrated his virtuoso skills in what he described as ‘five studies in a single painting’. Above is A Cat with a Young Bird in its Mouth, and below is A Cat and a Chaffinch. These were assembled from observations of living and dead animals and birds, and sketches, to produce composites which photography could not challenge for decades, even in monochrome. Bruno Liljefors (1860–1939), A Cat and a Chaffinch (1885), oil on wood, 35 x 26.5 cm, Nationalmuseum, Stockholm, Sweden. Wikimedia Commons. 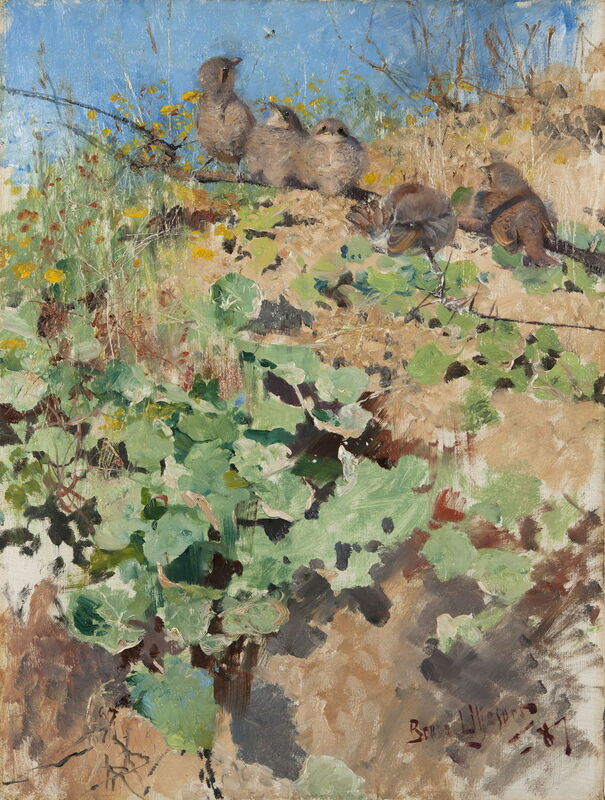 Bruno Liljefors (1860–1939), Hare Studies (1885), paper, 32 × 24.5 cm, location not known. Wikimedia Commons. Following the tradition established by Dürer, one of Liljefors’ favourite species was the elusive hare. 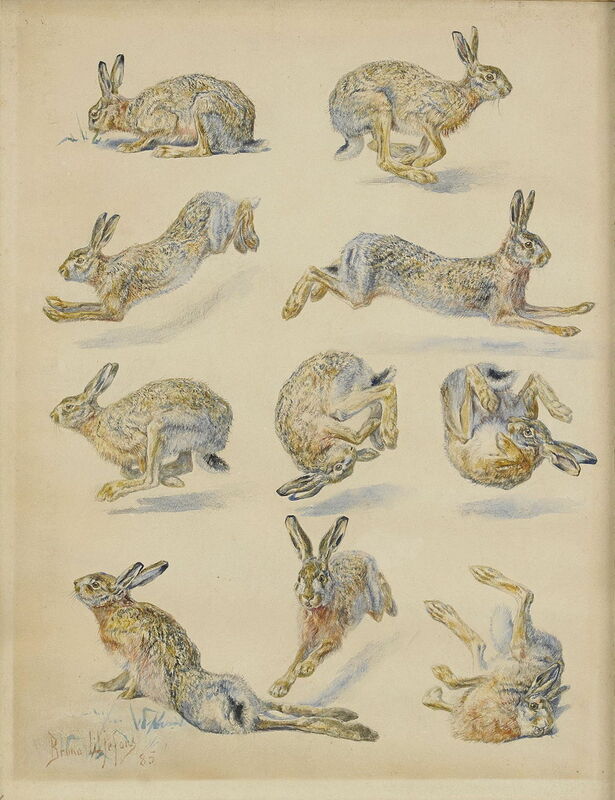 This page of Hare Studies from 1885 shows a tiny part of the image library which he assembled, as well as the spring antics of hares. Liljefors also assembled his own wildlife park, with living and apparently quite tame creatures, including foxes, badgers, hares, squirrels, weasels, an eagle, eagle owl, and others. Bruno Liljefors (1860–1939), A Fox Family (1886), oil on canvas, 112 x 218 cm, Nationalmuseum, Stockholm, Sweden. Wikimedia Commons. 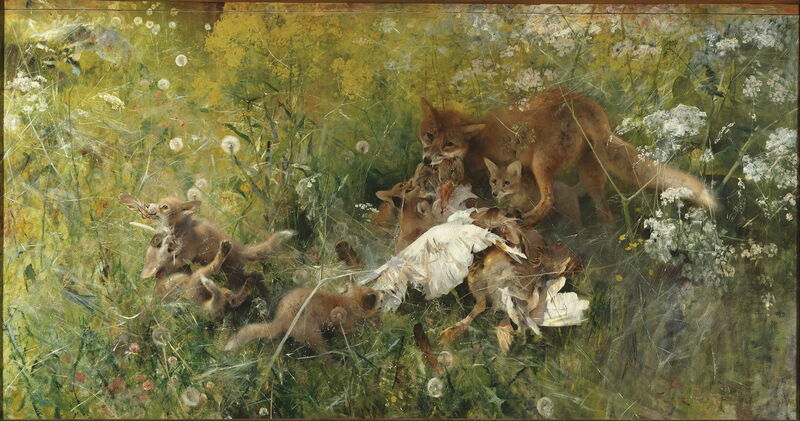 The fox also appears in many of Liljefors’ paintings, here A Fox Family (1886) in their role as predators, as they feast on an unfortunate bird. 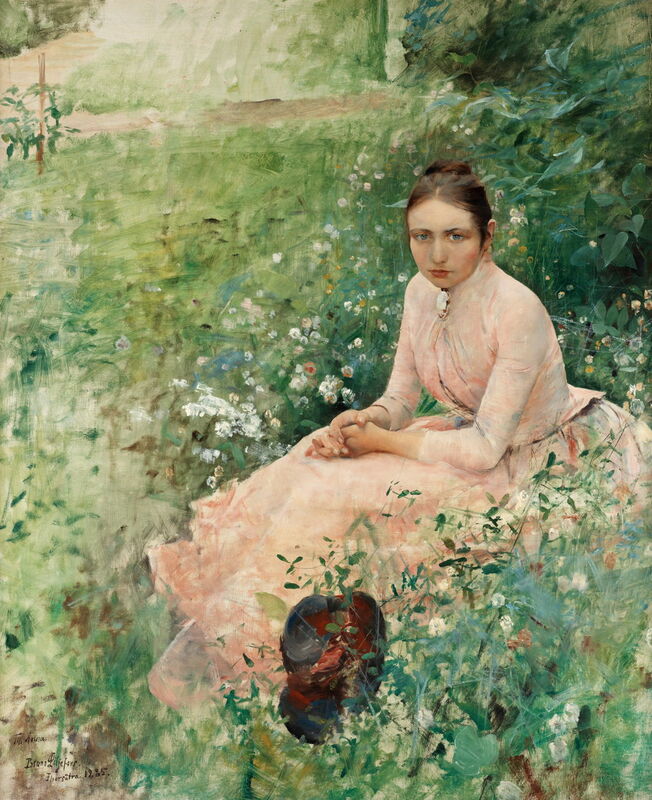 The rich floral setting appears to have been influenced by the paintings of Jules Bastien-Lepage. Bruno Liljefors (1860–1939), Jays (1886), oil on canvas, 51 x 66 cm, Nationalmuseum, Stockholm, Sweden. Wikimedia Commons. 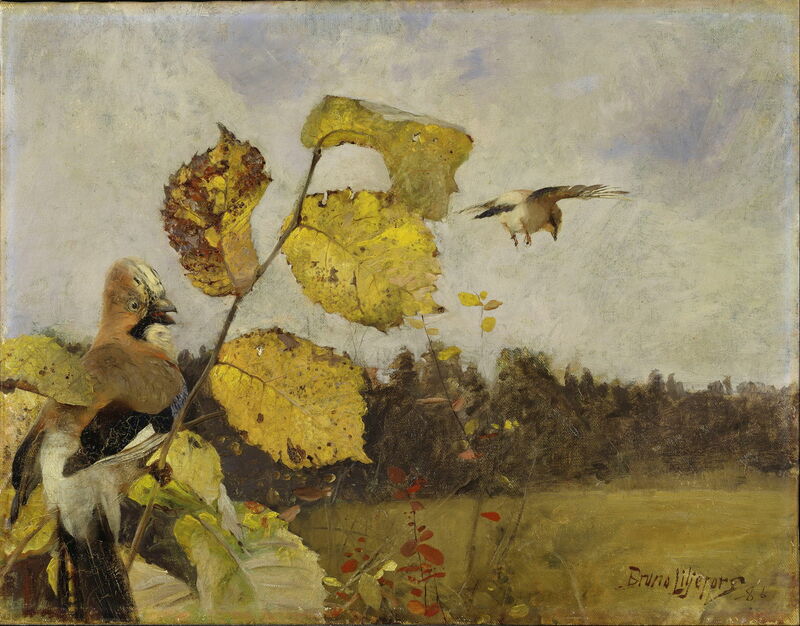 Liljefors’ paintings were often very painterly, such as in Jays (1886) which gives the impression of having been painted en plein air, in front of the birds and landscape. Even for the modern amateur photographer, the fleeting form of Common Swifts (1886) is a great challenge. Set against a riot of flowers, these birds are the product of field observation, museum specimens, and careful studies, and look real. Bruno Liljefors (1860–1939), Red-Backed Shrike Chicks (1887), oil on canvas, dimensions not known, Nationalmuseum, Stockholm, Sweden. Wikimedia Commons. Liljefors enjoyed great insight into the species that he painted. The five Red-Backed Shrike Chicks (1887) shown here may not, at first sight, appear in keeping with their popular name, the ‘butcher bird’, but the chick at the left end of the branch is already taking an interest in a passing bee or fly. When a little older, it will catch it and impale the corpse on thorns in its larder. Posted in General, Life, Painting and tagged Bastien-Lepage, landscape, natural history, naturalism, nature, painting, Zorn. Bookmark the permalink. I’m not surprised at the demise of the marriage. I recognize her. She was adrift; afloat; ‘off the path,’ so to speak. Her melancholy nature (like that hat) sits heavy and dark in the pit of one’s stomach like a stone. She’s miserabke..and constantly tells you so. Bless her. I would expect she ended up in an institution.